These are the only "fries" we make at our house. 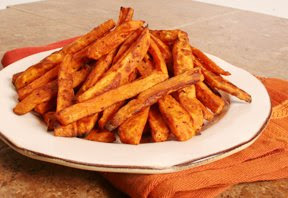 It's one of the few ways that I can get my boys to eat sweet potatoes. Serve them up with some fry sauce. 3. Bake for 10 min., flip & bake for another 20 min. or until done. If you want them a little crispy, place them under the broiler for a minute after they've finished baking.